Wow, I’ve really fallen behind on updating the blog recently, but I have a new batch of invitations to post about! 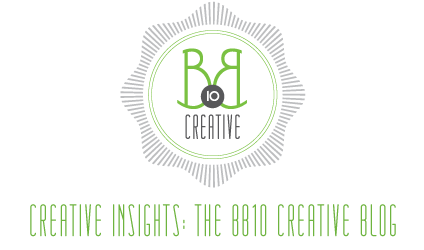 September has become a very popular month for weddings and with some late minute additions, BB10 Creative has been working on sending out over 500 invitations in the month of June for four September weddings (and one late addition July wedding!). This is a bit out of order, but wedding number two in our September line up takes place September 3rd for a great couple, Lisa and Raul. Lisa and Raul came to BB10 Creative looking for some unique wedding invitations to fit the theme of their wedding – baseball! Lisa and Raul were the second clients of BB10 to get married at Miller Park in Milwaukee. Being a big Brewer fan myself, I was very excited to make another set of baseball theme wedding invitations. Lisa and Raul decided on a marine color scheme for their wedding and ultimately picked the following design for their invitations. 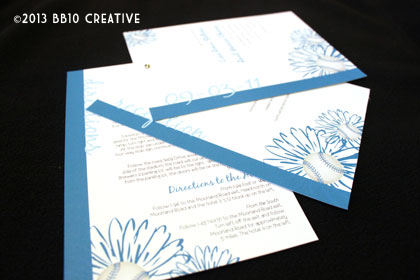 Baseball theme invitations can be tricky because you generally want them to be formal enough to say “wedding” but still fun enough to say “there’s a baseball theme here.” Incorporating the baseball in the center of the flowers was one way solve the issue and comes across as formal while still being fun. We used the marine color palette for the design, with a more modern sans-serif font paired with a brush script. 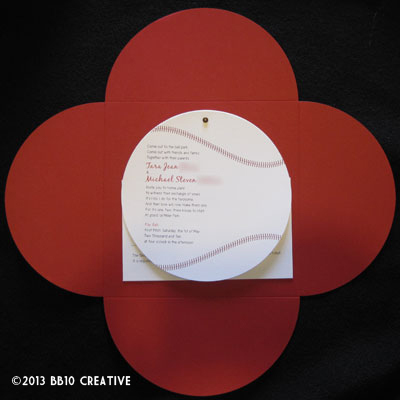 The invitation was printed on a clean white linen cardstock, and then bound together with silver brads at the top. The invitation was housed in a 5×7 marine petal enclosure that was sealed shut with a custom sticker that matched the invitation design. The whole package was then mailed out in a very elegant silver metallic envelope. Lisa and Raul also liked the idea of using the shape of home plate as their RSVP card, which is something we had previously designed for Mike and Tara’s invitations. 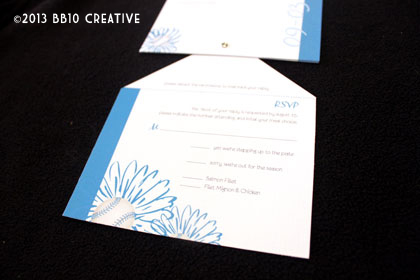 The RSVP card is then perforated so guests can detach and mail back. Overall, this turned out to be another fun and completely different baseball themed invitation that is still very elegant and formal. 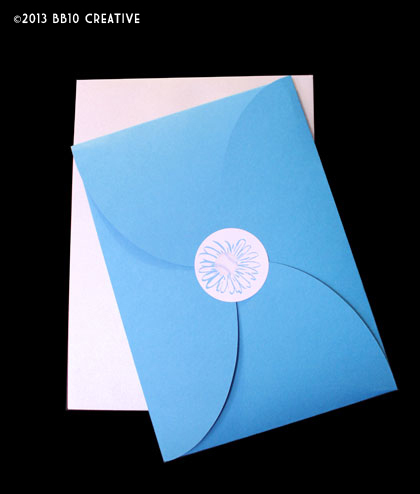 Petal enclosures add a really elegant touch to invitations, along with the metallic mailing envelopes. Coming up next is September wedding three of four – a very late addition to our line up, but a very fun invitation! Baseball Theme Wedding Invitations: Play Ball! Our third wedding of 2010 is taking place on May 1st 2010, between another great couple, Tara and Mike. 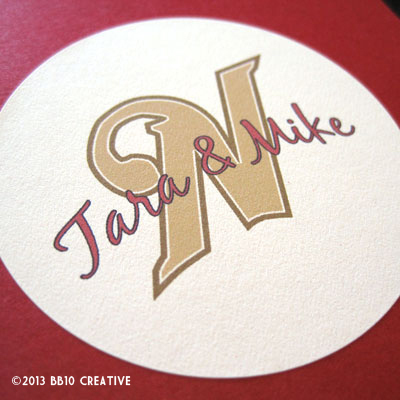 I have to admit, I was pretty excited when Tara and Mike came to BB10 Creative for their invitations because I am a big Brewers fan, and they are getting married at Miller Park! That being said, the theme of this wedding is pretty obvious – baseball! 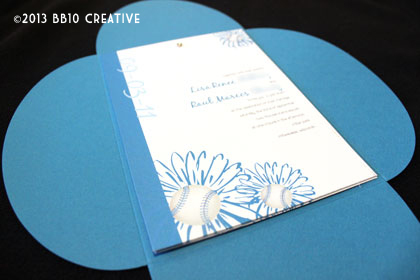 Tara and Mike wanted a fun and unique baseball theme invitation, but still wanted to keep it somewhat formal for a wedding. 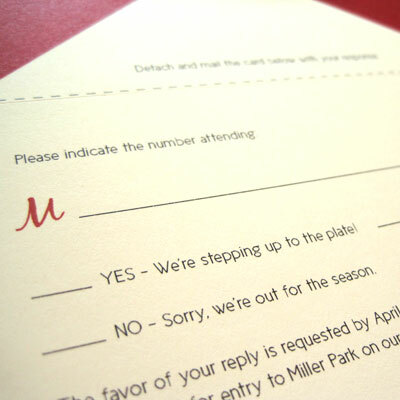 They knew their colors were going to be red with a tan/brownish accent, and that we needed to include an actual baseball ticket from Miller Park so that their guests are able to enter the ballpark for the wedding. Tara and Mike also decided to send save-the-dates and in keeping with the baseball theme, we created actual baseball cards with a photo of the couple on the front and the wedding “stats” on the back. I love the way the materials came together for this wedding, and it goes to show that you can still have a really fun, unconventional theme for your wedding while still keeping traditional elegance and class for the event. 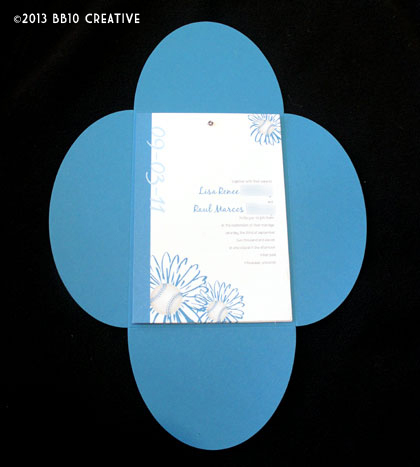 As always, check back on wedding invitations page of BB10 Creative to see all the final materials for the wedding including matching programs, a place card sign, and thank you cards!